In the ongoing Amsterdam Light Festival, illuminating the city’s waterway, a Serbian artist duo’s installation of an LED version of Vincent Van Gogh’s iconic painting ‘The Starry Night’ has drawn attention to the growing menace of light pollution in urban areas. 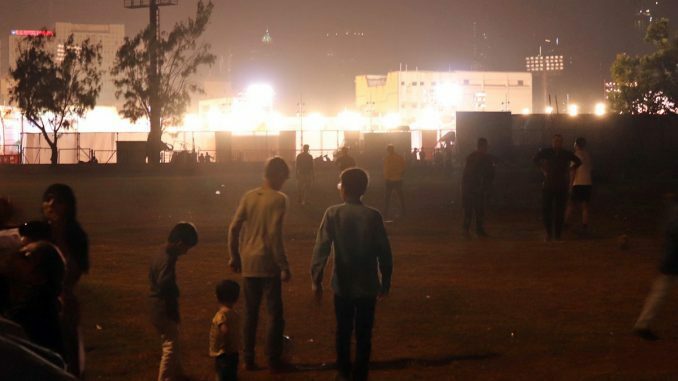 7000 kilometres away, in India’s commercial capital Mumbai, Nilesh Desai is steadily working on a public interest litigation on light pollution-disturbance due to excessive, inappropriate and misdirected artificial lights. For the last couple of years, Desai, who holds a day job in the information technology sector, has been fighting against the excessive and obtrusive glare of floodlights in his neighbourhood. He has fired off over 20 complaints with state and civic authorities on the nuisance of light pollution along Mumbai’s Marine Drive, a scenic curved beachfront promenade. He likens his ordeal to a “curfew-like situation”. “We live in curfew like situation when floodlights are on. I ask my kids not to look outside windows as it may harm their eyes. We have put up thick curtains in our houses to block out the glare from floodlights installed by the Wilson College Gymkhana [a club]. My neighbours have to use blinds to block the light so they can watch television in the evening,” Desai told Mongabay-India. The concerned father added that according to the Marine Drive Police station, floodlights can cause accidents at the beachfront and is a nuisance to citizens who visit the promenade. Desai’s complaints prompted the Mumbai civic authorities to act and ask the gymkhana to take down the lights. “But the catch is there are no laws to fight light pollution so the civic body has asked the state government and pollution control board to draft norms for light pollution in the city,” Desai explained, promising to generate more awareness on the emerging issue in India. Light pollution can come in forms such as glare, light trespass and skyglow in addition to over-illumination and clutter. The damaging effects of light pollution on human and ecosystem health are being increasingly acknowledged worldwide. With our sleep-wake rhythm synced to the day-night cycle, excessive artificial illumination can disrupt health contributing to poor sleep, obesity, diabetes, certain cancers and mood disorders. Artificial light at night puts a spanner in the works for nocturnal animals, interfering with reproduction and impacting populations. For young turtles and birds, disorientation can be fatal. 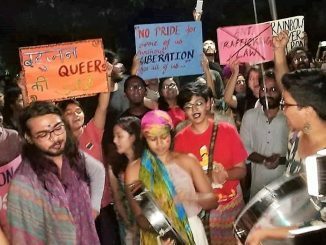 “People are already experiencing the effects of light pollution in various forms, but we do not recognise it as pollution in India yet,” Desai lamented. His observations are not in isolation. A study published in Urban Climate journal in January 2019 has shared Desai’s concern that the brightness from outdoor lights is on a steady rise in various parts of India over a 20-year period. 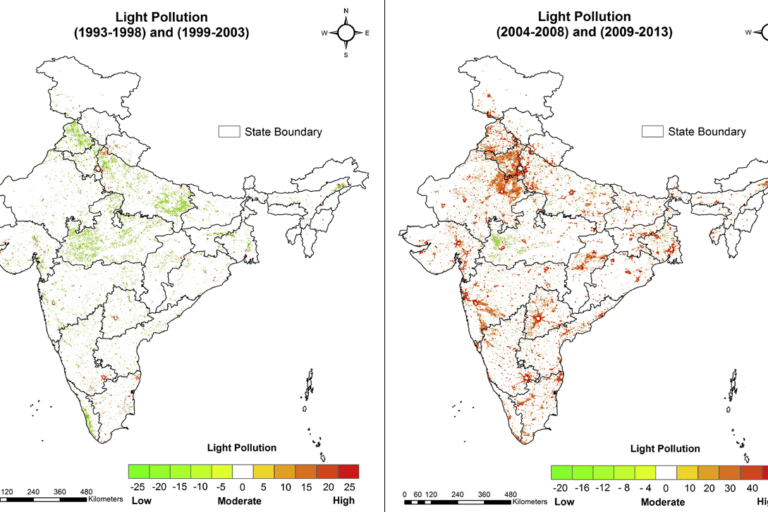 Discussing the findings, study author Pavan Kumar said New Delhi, Telangana, Maharashtra, Karnataka and Uttar Pradesh experienced increase in “very high light pollution intensity” from 1993 to 2013. “This means that these states already had a high level of light pollution which has gone up further over the years,” said Pavan Kumar of Kumaun University, Uttarakhand. In states such as West Bengal, Gujarat and Tamil Nadu, outdoor brightness due to artificial lights, transitioned from low to high in 20 years. Urban expansion, cropping up of new suburban residential areas and industrial and agricultural development are attributed to increasing brightness in these patches. Urban expansion, industrial development and air pollution have been the main actors for increasing light pollution in these states. “Only two states, Assam and Madhya Pradesh, exhibited decrease in light pollution from 1993 to 2013,” Pavan Kumar told Mongabay-India. Decrease in brightness was predominantly identified in the areas having small undeveloped urban areas and where mineral extraction industries have been closed and transformed into some other infrastructural facilities. “This is true for Assam and Madhya Pradesh where air pollution is also low. Both these states are also maintaining and enhancing natural unlit areas,” pointed Pavan Kumar. To map the upward light emissions from outdoor light sources, the researchers turned to eyes in the sky. They acquired night time light satellite-based imagery of the US Air Force Defense Meteorological Satellite Program (DMSP) to chart trends. DMSP designs, operates, and maintains satellites for monitoring the meteorologic, oceanographic, and solar-territorial environments. “If you see closely, the streetlights that we have do not focus the light rays on the streets itself, they emit upwards too. This light as captured by satellites orbiting in the sky has been used as an indicator of light pollution in our study,” said Pavan Kumar. “The night time light data that we used is linked to outdoor light sources in urban areas so it doesn’t capture the sky glow which refers to the orange glow or brightening in urban areas caused due to excessive light,” explained co-author Meenu Rani of G.B. Pant National Institute of Himalayan Environment & Sustainable Development. 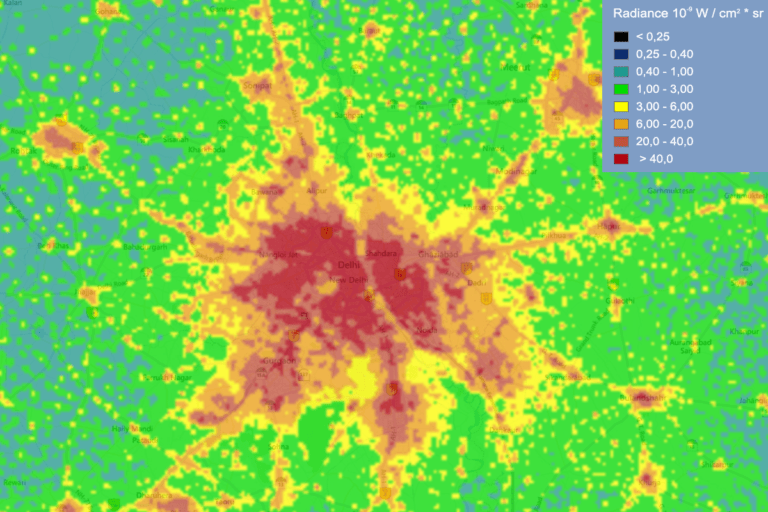 Light pollution map of Delhi and it’s adjacent areas. Map by Jurij Stare, www.lightpollutionmap.info. VIIRS/DMSP data credit: Earth Observation Group, NOAA National Geophysical Data Center. According to the International Dark Sky Association, when streetlights come on, light rays branch off in different directions. Some of the light rays are directed up into the sky and travel completely through Earth’s atmosphere. Of these rays, a few will be detected by satellites as they pass over the night time side of our planet. In still other cases, rays are scattered back to the ground by dust particles or molecules in the atmosphere, forming the familiar “sky glow” seen over cities. Occasionally, rays directed downward reflect off the ground into the sky, where they might escape the atmosphere and be seen by satellites. Lastly, some downward-scattered rays make it into astronomers’ telescopes, effectively blocking their view of the universe, the association said. In 2017 results of a global study pointed out the “loss of night” due to excessive artificial light at night for India is three times faster than the global average. “The problem is that ‘light pollution’ can mean a lot of things. Artificial sky brightness is light pollution, glare that prevents you from seeing well is a form of light pollution, when someone’s lamp shines in your bedroom that is light pollution, and when artificial light affects animals and plants, that is light pollution,” Kyba told Mongabay-India. “If you have large increases in light observed by satellite, then it is very likely that many of the other types of light pollution are getting worse,” he said. While Desai and others push for guidelines and norms, Pavan Kumar and colleagues also bat for regulation of outdoor light consumption in core urban areas (where maximum use of light has been found) by implementing laws to maintain the minimum level of light consumption. “Adoption of efficient lightning sources and their accessibility among people can go a long way in reducing level of light pollution,” said Pavan Kumar. Indian government data says over 21 lakh LED street lights have been installed across the country under Street Light National Programme. Kyba believes that everyone who installs lights can take action. The most important things are that lights should not be brighter than necessary, and outdoor area lighting should not shine down. “For example, illuminated LED video signs should be dimmed at night. They are actually really unpleasant to look at during night if they are not dimmed, because they are so much brighter than the surroundings. In general, making things brighter won’t make things more visible – what matters is how the light is distributed. So people should try to use the least light that allows them to see well,” Kyba explained. The researchers echo Kyba’s suggestion that with area lighting, it should be installed so that no light shines into the atmosphere — that is, all the light should go downward. “Cities can adopt policy to require advertisers to turn off lights after a certain hour, or put restrictions on what types of area lighting is allowed, or restrict how bright signs can be. There are lots of possibilities,” Kyba said. As light pollution hides the night sky, it has also sparked an interest in the latest travel trend: astrotourism. Desai, who recently indulged in a round of night-time photography in Malshej Ghat, a small hill station near Mumbai, wants to seize this opportunity for greater awareness. For starters he has written to Maharashtra Tourism Development Corporation on light pollution awareness and to make the site dark sky compliant (stem light spillover). “This will provide citizens an experience to witness a truly dark sky, see the Milky Way and astronomical events and in turn increase revenues and awareness on light pollution. They liked my idea and will be working to make not just this location but several locations across Maharashtra dark sky compliant,” Desai added. Sahana Ghosh is a science journalist and staff writer at Mongabay India. 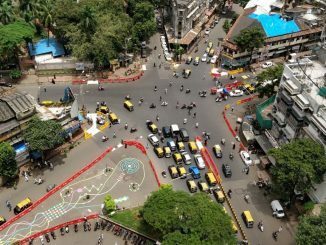 The new design by WRI India, implemented on a temporary basis, intends to change the current approach of designing intersections – from one that prioritises motor vehicles to one that considers all road users. 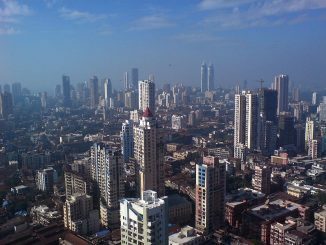 What’s keeping Mumbai parched? What are the latest measures being mulled in Delhi to combat pollution? Which housing projects will be exempt from prior green clearance? A look back at the important headlines from India’s cities this week.